OIS iMobile, developed by Orders In Seconds, Inc., is an easy to use POS system and business management system that can be run in the palm of your hand on an iPhone, iPad, or iPod Touch. This application will sync your data while you are out of the office, so ditch the phone calls and emails that you used before and easily keep information between the field and main office organized with OIS iMobile. One of the powerful tools that the app has includes the ability to use customer templates. This makes reordering a breeze, especially if you have repeat customers who are purchasing the same items. All you have to do is change the quantity and the order is ready to go. OIS iMobile also keeps track of your inventory. Just set it up once and know how much you have on hand instantly. This application is perfect for companies that have field reps. All of your data, processing, reports, and order taking can be done from your iPhone or iPad. This makes it super easy. Having to manually log into a remote computer over your iPhone or iPad can be a big pain and slow you down. With OIS iMobile you can get things done more efficiently and effectively. It has all the tools you need in one easy to use application. 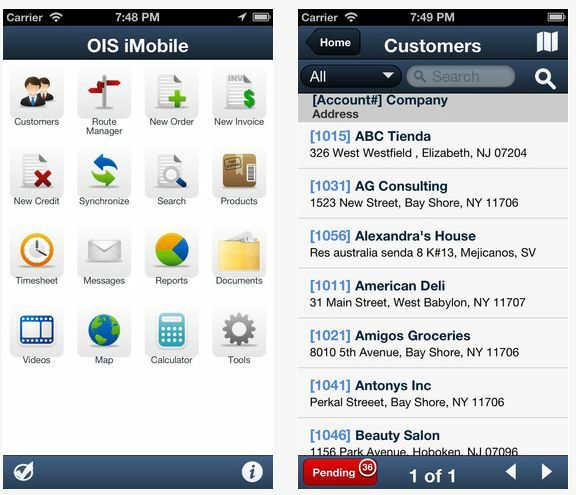 OIS iMobile integrates with some of the most popular applications, including QuickBooks, Peachtree, and Sage. If your interested in moving your business mobile or just want access to your entire business from on the go, OIS iMobile is worth checking out. Sign up for their FREE 30 day trial and get started today. OIS iMobile is currently FREE on the Apple App Store. You can use a demo account for thirty days, but for full functionality you will need to have an account with the company.